iChristian.com: Every Christian cares about eternity, but you have a special passion and focus on the world to come. What causes that special passion? Randy Alcorn: I’ve always been struck by the teaching of Scripture that this world is not our home, that our citizenship is in heaven, we’re ambassadors representing a foreign country, we’re pilgrims and strangers on this earth. My best friend from childhood, Jerry Hardin, got cancer eight years ago. One day I was reading him Revelation 22. I read verse 17, which says “Whoever is thirsty, let him come; and whoever wishes, let him take the free gift of the water of life.” As I was reading those words to Jerry—an invitation to come to heaven—he died. That had a powerful effect on me. My Mom and Dad and several other close friends and loved ones have died. I’ve seen that people who live with an eternal perspective die well. They’re ready for the transition from this life to the next one. And I’ve seen people who weren’t ready, and that’s tragic. I want to be ready to meet my Lord, and I want to help others get ready. That’s why so many of my books emphasize the realities of heaven and hell. iC: In writing Lord Foulgrin’s Letters, did you sense any different level of spiritual warfare than when writing your other books? RA: Once I woke up in the middle of the night, and I felt like I was under serious attack. I had a deep sense of terror and foreboding. I got on my knees in prayer and cried out to God to protect me from the evil ones. It wasn’t as dramatic most days, but I had a prayer team lifting me up like they do as I write each of my books. The subject matters of my other books are also threatening to the kingdom of darkness, so prayer is always critical. Jesus said “Apart from Me you can do nothing.” I always have to depend on the Lord for strength, encouragement, and direction. Often while writing Lord Foulgrin’s Letters, sometimes several times an hour, I would drop to my knees and say, “I can’t do this. Help me, Lord. Anoint this, use it for your glory.” I pray this book is a holy vessel useable to the Master. That’s what I seek to be. iC: The Afterword mentions the difficulty of getting into a demon’s head without letting him into your head. What was the mental process of trying to get in character for writing Foulgrin? RA: It was a big challenge. My editor and I agreed that we wanted to make sure Foulgrin wasn’t just Randy Alcorn wearing a demon mask. Demons aren’t just abstract concepts or literary devices. Demons are real. They have personalities. They have thought processes and uniquenesses and their own names and identities. Daniel 10 shows they have their own geographic areas of assignment. They aren’t omnipresent, and to mobilize their efforts in warfare they have to convey messages to each other. I prayed for protection and insight, then I went to all the Scriptures that talk about demons. In reading Ezekiel 28 and Isaiah 14, you get a sense of the pride, arrogance, and self-exaltation of Satan. In Lord Foulgrin’s Letters I develop these character flaws and others, as the demon Foulgrin advises Squaltaint how to deceive and destroy Jordan Fletcher and his family. iC: Was it fun part of the time? The book has some humorous touches, such as showing Wormwood’s punishment for letting the original Screwtape letters go public. RA: Certainly I don’t want anyone to take lightly the evil one and demonic warfare. Martin Luther took Satan so seriously he once threw an inkwell at him. But Luther also said we should jeer and flout the devil because he cannot bear scorn. Yes, Satan is a roaring lion seeking to devour us, but our all-powerful God has him on a leash. As long as Christ is our rock of sanctuary and we trust in his power not our own, I think it’s appropriate to have a little fun at the expense of demons, as C. S. Lewis did with the Screwtape Letters. I didn’t want Lord Foulgrin’s Letters to be a dark thing, though it is very sobering at points. I wanted people to be challenged and contemplative, but also be able to smile because they’ve seen things in a very new way. There’s a satisfaction that comes from knowing you’ve heard the opposing coach sketch out his plays for the second half and you know what to expect, how to fight back and win. iC: In your book, we learn that hell’s literature committee has a Top 100 Favorite Books list. Could you name a few titles you suspect are on the list? RA: Certain books are obvious candidates, such as the Book of Mormon and Charles Darwin’s Origin of the Species, and Bertrand Russell’s Why I Am Not a Christian. New Age books such as The Celestine Prophecy and Betty Eadie’s Embraced by the Light have sold millions of copies while distorting truth. Eadie’s book seemed positive, but the nature of heresy is the blending of truth and error, where the truth draws people to the error. Embraced by the Light teaches you don’t have to be a follower of Christ to go to heaven. Hence, even though parts of it may be true, it sends an ultimate message that’s from the pit of hell. iC: What’s the meaning behind the geographical names you use in the book to represent heaven, hell, and earth? RA: Charis, the word I use for heaven, is the Greek word for “grace.” Erebus is a word from ancient literature that meant the domain or kingdom of darkness. It’s not an exact synonym for hell. We see all these “Far Side” cartoons and imagine demons are in hell torturing people who have gone there. When demons go to hell, they’ll not be punishers they’ll be punished, but most of them aren’t there yet. I envision Erebus as a government in exile, in a place with access to earth, where Satan’s rebel army is at work, not torturing the dead in hell but tempting the living on earth. Skiathorus comes from skia, the Greek word for darkness, and thorus, Greek for window. Thus, earth is a window of darkness. It’s also a window of opportunity. The choices we make here cast a vote for heaven or hell. They will have eternal impact. iC: What do you hope Lord Foulgrin’s Letters accomplishes? RA: Certainly I don’t want it to encourage any sort of unhealthy preoccupation or fascination with the kingdom of darkness. Rather, in the sense that Ephesians 5:11 speaks of, I’m trying to expose the darkness by shining light on it in a creative literary fashion. I want this book to be an instrument that conveys truth and serves as a wake-up call that makes us aware of the devil’s cunning and his strategies to destroy us and derail us. I hope it opens eyes to the reality of the battle we’re engaged in. I pray the result will be that people know God better, know themselves better, and know their enemy better. If that happens, God will be pleased and I’ll be delighted! 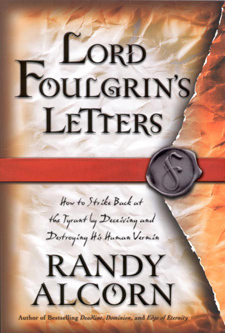 For more information on this subject, see Randy Alcorn’s book, Lord Foulgrin’s Letters.